I cook with tomatoes all the time. Not only are there a multitude of recipes with tomatoes, but I can always count on their addition for the making of a great dish. When I’m not using fresh tomatoes, I will often choose Hunt’s for a top quality tomato. They are passionate about fresh and believe that only the finest ingredients can make the best meal. I would have to agree. I believe using quality ingredients really makes the meal. Hunt’s tomatoes are grown in California and picked at the peak of ripeness. The Hunt’s farmers grow 55 different types of tomatoes so that the Hunt’s tomato experts can choose the best ones based on their sweetness, texture and flavour profile. It’s really not surprising to me that Hunt’s is the #1 tomato in blind taste tests. In addition, tomatoes are good for you! Sure, they taste great and make the meal, but they are also a source of Vitamin A, C, Fibre and Potassium. They are also naturally fat-free so I never feel guilty eating them! 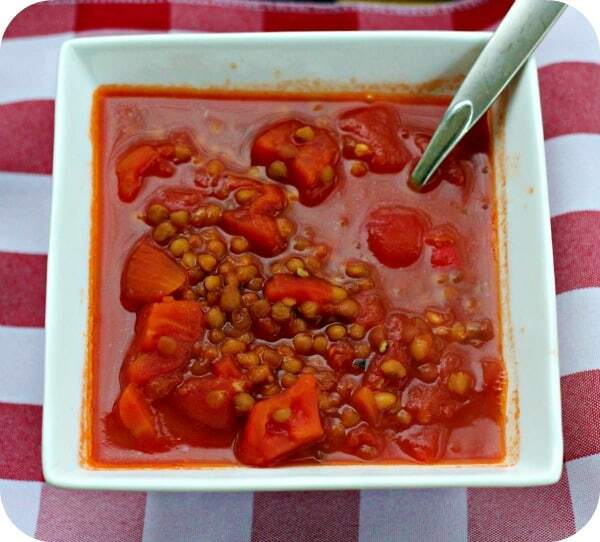 I whipped up David Rocco’s recipe for Tomato & Lentil Soup. It calls for really simple ingredients and most of them I already had on hand in my pantry. The chili peppers give it an extra kick of spice. It worked wonders on my cold! It’s hearty, filling and so delicious. It was a hit with everyone and I will definitely making it again. After the cold winter, we’ve been having, there’s nothing quite like a hot bowl of soup. 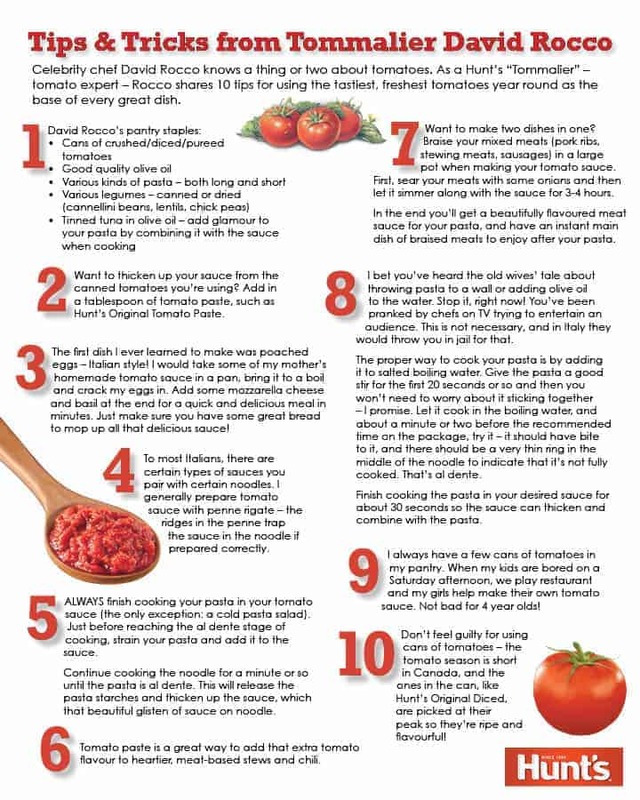 For more tomato recipes, please check out Hunt’s online! Tommalier, David Rocco, answers some important questions about tomatoes and being a Tommalier. Did you know what a Tommalier was? I hadn’t prior being introduced to David Rocco through this post. This guy really knows his tomatoes! Q: What is a Tommalier? A: A Tommalier really, really knows their tomatoes. A Tommalier is passionate about, and an expert in, tomatoes! Think of a Sommelier – as you probably know, this is a person specializing in all areas of wine service and food & wine pairing. A Tommalier displays that same knowledge and passion when it comes to the freshest, ripest tomatoes used for cooking amazing tomato-based dishes. Q: What are the benefits of cooking with tomatoes? 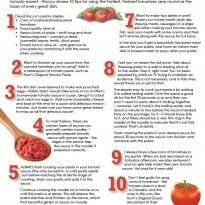 A: Tomatoes are the ideal base ingredient for a huge variety of memorable meals, from soups and stews to sauces. The possibilities are really endless with tomatoes – they provide the perfect starting point and you can add so many different ingredients to tomatoes to create diverse, delicious meals. Q: Is there a difference between cooking with fresh and canned tomatoes? A: The tomato harvest season is very short in Canada; you’ve got to grab them while you can! But that doesn’t mean you’re out of luck for the rest of the year. Don’t feel guilty about using canned tomato products – the ones in the can are picked at the peak of freshness, so they are ripe and flavourful. 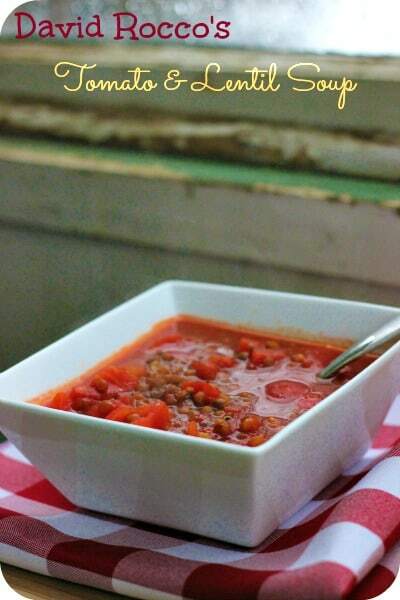 That amazing flavour will come out in your tomato dishes year round. Q: Tell us why tomatoes are great for holiday cooking. A: Tomatoes are great for any time of year! During the holiday season in particular, people are doing a lot of hosting and also have family and friends dropping in unexpectedly over mealtime. 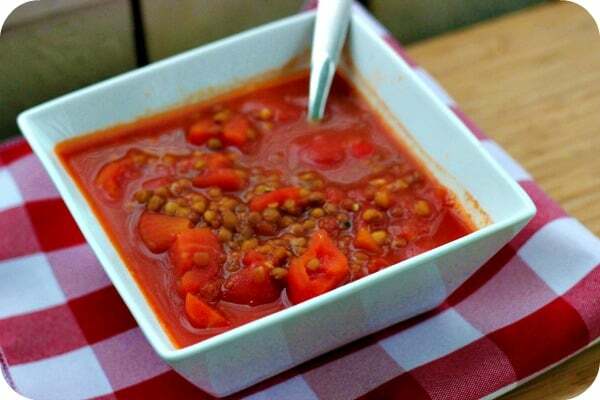 It’s easy to whip up a delicious tomato-based dish, like Tomato Lentil Soup, for when family and friends come calling. It definitely doesn’t taste like it’s just been thrown together! Keeping your pantry stocked with key items like tomatoes, tomato paste, canned or dried legumes, pasta and canned tuna means you’ll have everything on hand to create a memorable meal for loved ones at a moment’s notice. In a saucepan, heat olive oil. Add garlic, parsley and chili peppers and sauté for a few minutes until the garlic has started to turn golden. Pour in the diced tomatoes with the juice right from the tin. With the back of a wooden spoon, break up the tomatoes into little chunks. You can decide the consistency. Then add in the rinsed lentils, salt and pepper. Add tomato paste, and then add water about 1/2 an inch above the lentils. Bring to a boil, then lower to medium heat and cook for 20 minutes until the soup has thickened. Disclosure – This post was brought to you by enCompass Media on behalf of Con Agra Foods. Opinions expressed are my own.